My farm share just gave us the go ahead to pick AS MANY cherry tomatoes as we want! Is that crazy? So, there I am with my bucket standing, out in a field, jamming them into my mouth. After 30 minutes of hot work, I get a couple pounds of pure heaven. There is NOTHING like a fresh tomato picked off the vine and eaten within seconds. I really believe that and you can't argue with me. But, if you have a few pounds, you might want to dress them up a bit. After my field work, I got out one of my favorite cookbooks, "Clean Food" by Terry Walters (see below). Terry divides her book into seasons, and there it was - Chickpea and Cherry Tomato Salad with Cilantro Dressing - in the Summer section. I gave it a try and absolutely loved it. It is incredibly nutritious, and it has a fantastic texture. The softness of the tomatoes plays against the crunchy and nuttiness of the chickpeas. I used 2 cans of chickpeas (rinsed) for the recipe. 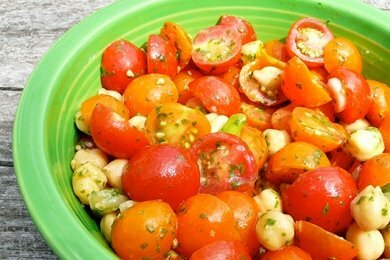 Cut tomatoes in half and place in large bowl of chickpeas and scallions. With food processor running, drop in whole garlic clove and mince. Turn off processor, scrape down sides, add cilantro, olive oil, lemon juice, salt and pepper. Pulse to combine. Drizzle dressing over salad, toss to coat and serve. How do you serve cherry tomatoes? Mmm... That salad sounds delicious... I have one cherry tomato plant in my garden and there are a lot of tomatoes coming off of that one plant so I can imagine your farm share probably has a ton. So far I've used my cherry tomatoes in kabobs on the grill along with other veggies, I've also used them in place of a larger tomato to whip up some quick guacamole to go with dinner, and in green salads. I love this idea though, I'll have to try it this weekend. Thanks Snack Girl! Tomatoes are my faves. I love to eat them right off the plant, too. There's nothing better. We roast 'em alongside other veggies (zucchini, yellow squash, bell peppers, etc.). Just cut 'em up (halved for cherry tomatoes), lightly toss them in a drizzle of EVOO and lightly salt. Lay them out on a foil-lined cookie sheet at 400 degrees until they're as done as you like (20-30 min or so). Then you can eat them as a side, or toss into pasta or wild rice or whatever! Very versatile. Very good. Very good for you! Thanks for this recipe, Snack Girl. That looks really god and mostly sounds good, but I hate cilantro. Bah. Wonder what else I could try? Try cherry tomatoes, cucumbers, red bell pepper, red onion and feta cheese. Dress with a little white or red wine vinegar and olive oil. Salt and pepper and any season mix (Mrs. Dash, Italian Seasoning, etc). This will become another summer staple! Sounds great! I'll have to bug my inlaws for more tomatoes. Sliced them in half, cooked over med-high heat with pepper and a bit of olive oil until they started to come apart and the juice made a sauce. Tossed with leftover cooked pasta (something big ... smaller would have been better) and grated a bit of a fresh mozzarella ball over top. That looks so fresh and delicious. I have that book on my wish list on Amazon. Maybe I should bump it up to "buy" status! That sounds so yummy. I love cilantro in the summer especially it is so cooling and refreshing.I will be have that salad for lunch tomorrow. Also am sending a copy to my sister.